endless logo debates and, oh right, the beer. Joy Pecknold breaks down the trials, tribulations and thirst-quenching payoff of developing Vancouver's newest craft brew pub. Around the time that SCTV's brothers of the Great White North, Bob and Doug McKenzie, had their pop-culture moment (chugging their way into Canadian stereotype history one stubby at a time), the craft-beer revolution was brewing. Heading into the 1980s, there were only 10 brewing companies left in the country, and 96 per cent of the market was cornered by three of them: Molson, Labatt and Carling O'Keefe, which offered seemingly identical versions of featherweight, fizzy lagers. But in June of 1982, British expats John Mitchell and Frank Appleton opened a brewery in Horseshoe Bay, B.C., spurred on by the frustrating dependency on the big three – the taps at Mitchell's Troller Pub ran dry one summer because of a strike – and a mutual distaste of bland, hop-less beers. The enterprise only lasted three years, but the project changed provincial legislation to permit microbreweries and brew pubs, and by the end of the decade, Canada had 42 new breweries. Today, the nation's brewery count exceeds 500, a number fuelled by the second craft-beer wave. The growth – a 70 per cent increase in the last five years alone – is especially evident in B.C. where further changes to liquor laws allowing breweries to have on-site lounges and tasting rooms in 2013 set off a spree of openings. One of the latest arrivals set to capitalize on the seemingly unquenchable Canadian thirst for a cold one is Vancouver's Strathcona Brewing Company. 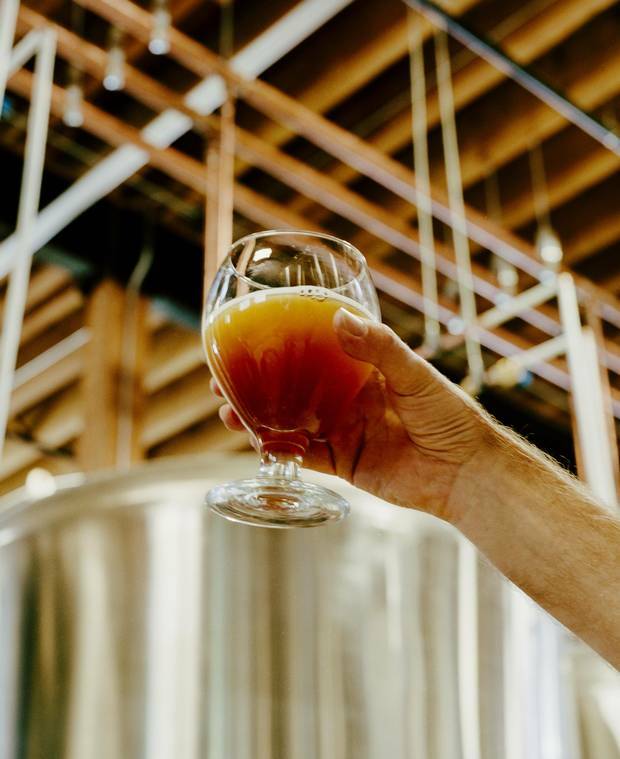 But, despite that appetite and the ease on regulations, the bumpy road to opening day illustrates that launching an indie beer brand is no small undertaking. Named for the East Vancouver neighbourhood the brewery calls home, Strathcona Brewing Company's address is both strategic and sentimental. Tim Knight, the company's president and creative director lived nearby on Keefer Street for seven years. "Strathcona's about being on your stoop, drinking beer. That's how I've met half my friends down here," he says. Knight's day job connects him to the area too. As director and senior project manager for Heatherbrae Builders, a general contracting company founded by his father in 1989, he's worked on many community construction projects, including the local school. 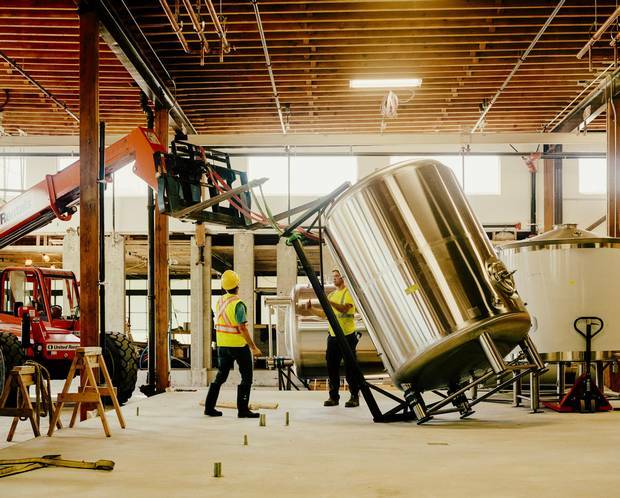 "The brewery is just another piece of the puzzle for me. I can come back, give back and provide jobs." 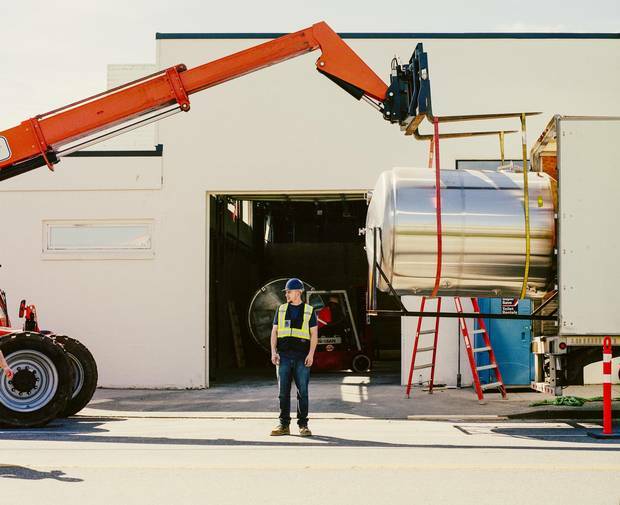 Located on Hastings Street, a major traffic artery into downtown Vancouver, the brewery will be seen by some 170,000 commuters every day, according to Knight's research. South of the main thoroughfare, the neighbourhood is largely residential, with a number of new developments proposed for the area. But a few blocks from their building is the Downtown Eastside, also known as the poorest postal code in Canada, where drug use and prostitution is common and unconcealed. When the brewery location was announced in October, it received criticism from a nearby community centre and housing complex for the kind of unseemly crowds it might draw. Knight respectfully disagrees with that forecast and the effect it will have on the neighbourhood. "We're going to try and give this corner some life, which in my mind, will improve it," he says. "There will be eyes on it, our eyes, bright light, all the positivity of it." 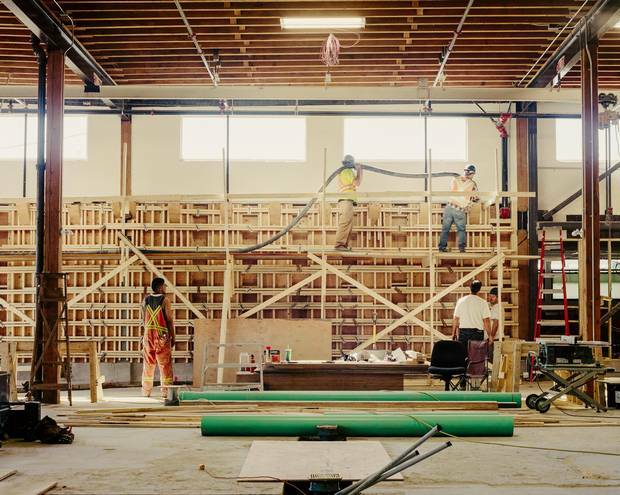 The process of turning a 10,000-square-foot, circa-1950s building into a brewery and lounge began last July. Since it is located in a manufacturing district, the building didn't require extensive rezoning, which made the reno a relatively straightforward process. Relatively. After receiving an unofficial endorsement from the City of Vancouver, Knight signed the lease and hired an architect to draw up blueprints. Then he met with the city again to have those preliminary plans approved. But the final building permit didn't come through until mid-April, so they bumped their opening date from May to June. Featuring a 67-seat tasting room and pizza kitchen, the design aims for an understated and old-school look, with board-formed concrete walls and neon lighting playing off both the heritage of the structure and the vibrancy of Hastings Street. Construction is the easy part for Knight, but the branding process was stickier. "Oh, God, the logo must have taken, like, three months; it was endless," he says. "We wanted it to feel like it had been around before – like the building – and also reflective of Vancouver." The end result, an "S" with a crown formed from fir tree silhouettes, was a group effort of his partner and brand manager Adrian McInnes, artist Andrew Dadson and Knight's wife, Aerin. 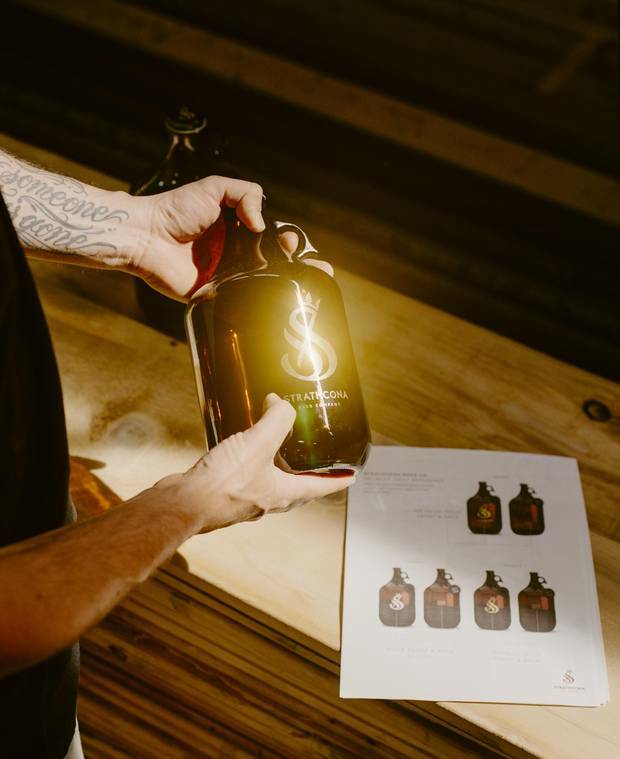 Strathcona Brewing Company brewmaster Michael Nazarec, production manager Tim Davis and brand manager Adrian McInnes collaborated on the Vancouver project, each bringing their own expertise in beer-making, building and design to the table. Its logo pays homage to its West Coast home by topping the letter “S” with a crown of fir trees. Much of the Strathcona team is made up of friends who have known each other for more than 20 years, many with experience in the design and apparel industries. They share an enthusiasm for packaging and ephemera that nearly outpaces the end product. Nostalgia for the Old English they drank when they were younger drove them to track down the same style of 40-ounce bottles for the brewery. A 200-square-foot glass box in the space will serve as a studio for artist and brand collaborations on labels and clothing. For their own merchandise, they're aiming for higher end products, including bomber jackets and balaclavas. Then, of course, there's the beer. That's under the purview of brewmaster Michael "Fezz" Nazarec, a broadcast sound engineer by trade with 30 years of home-brewing experience. Diverting from the experimental trend dominating the craft beer movement right now, Strathcona Brewing Company's focus is classic, international beers. A Czech pilsner, British IPA and Belgian golden ale are the foundation of the lineup. It's an approach motivated by the partners' personal tastes and a desire to draw a different crowd, one that's still drinking like it's 1980. As Nazarec asks, "how do you get to the other 75 per cent of people who aren't a part of the craft-beer revolution yet?" Knight's end game might be a bit simpler. While he favours Ray-Bans and a Ralph Lauren sweater over a toque and plaid flannel, there's still some Doug McKenzie in Strathcona Brewing Company's president. Capping off a tour of the construction site, he offers another reason for opening his own brewery. "Who are we kidding," he says. "We're doing it for the free beer." An earlier version of this story included a photo caption that referred to Tim Knight. In fact, it is Tim Davis.